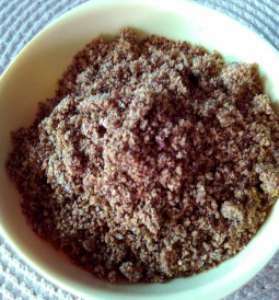 Roasted gram chutney recipe is a easy dry chutney powder recipe. Make when you have time and use at any time. 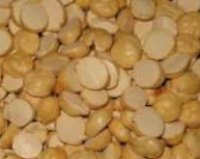 Roasted gram or bhuna chana is very commonly used in many snacks such as thin poha Chivda and also in fried poha chivda Tambittu unde / laddoo and you can also eat them as a snack by itself too. 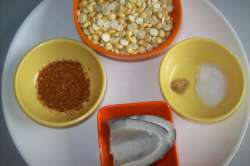 Roasted gram or roasted chickpeasis known as Puthane dal (marathi) or hurigadale (kannada) or bhuna Chana (hindi) or dalia (gujarati), pottu kadalai (Tamil), putanalu pappu / pacchi senaga pappu (Telugu) in Indian language. 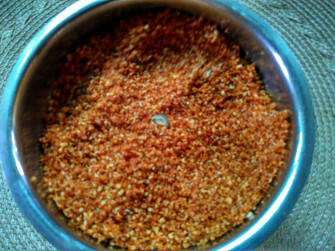 Roasted gram is available in Indian shops as seen in the image below. 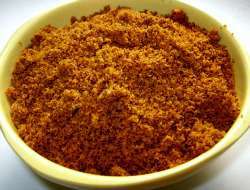 Here we are using puthane / roasted gram to make dry chutney powder. 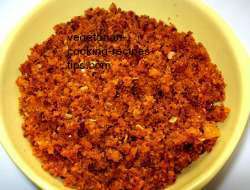 Puthani or roasted gram is also added to wet chutney to get good consistency and taste and bulk such as in coconut chutney. 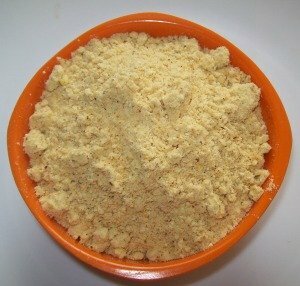 How to make putani - hurigadale chutney powder? Garlic pods - 6-10, more or less according to taste. Lightly roast the grated coconut on low flame for a few minutes till it is light brown. Roasting enhances the taste and flavor and also preserves the chutney for a long time. If you are sure to finish the chutney within 10 days you may omit roasting. It is better to grind the chutney a little coarse. I like that better than a too fine powder. You may add a table spoonful roasted groundnuts (peanuts) or til (sesame seeds) to this chutney. Dried curry leaves improve the taste and the nutritional value.